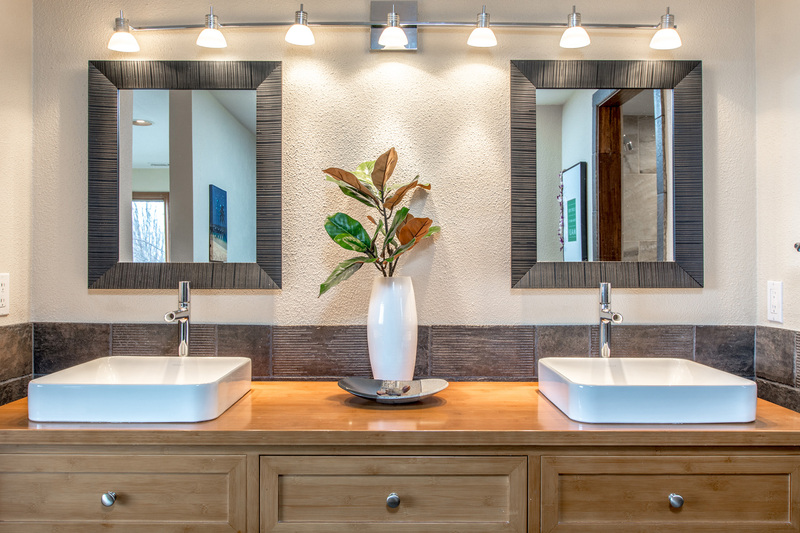 It can feel like the details are endless when you’re selling a property. Our job is to streamline the process for you, ensuring everything is completed as quickly and efficiently as possible. Here’s an overview of the steps we’ll be taking along the way when you invite the Cari McGee Real Estate Team to sell your home. We’ll begin by getting to know you and your home. We’ll visit and tour the home and we want to learn what you love about it, and what you’re less-than-thrilled with about it. We’ll talk about timeframes and your financial situation. Plus we’ll give you a general overview of the current state of the real estate market. After some number crunching (comparing nearby recently sold properties and how they differ from your house), we’ll visit again to talk about pricing — i.e., for how much you can expect the house to sell. 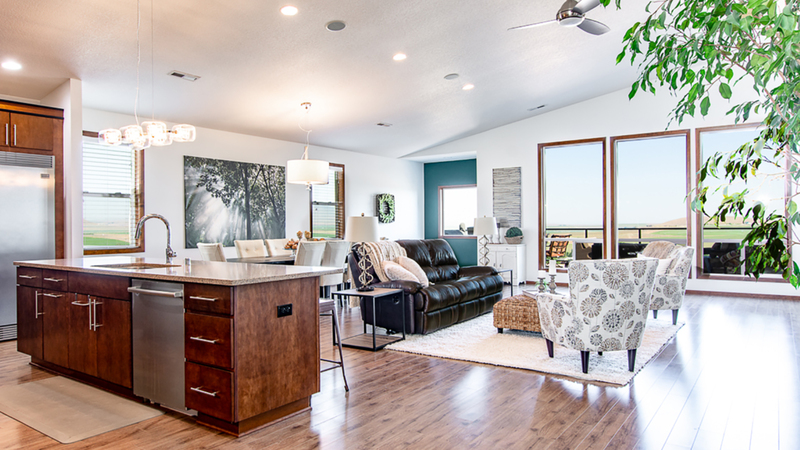 We’ll explain our marketing strategies and discuss the home’s staging needs. Almost every house can benefit from staging, so don’t be offended when the stager suggests changes like moving the sofa to a different angle, or removing the family photos from the living room. Her job is my job is your job: getting the house SOLD on your timeline and for the most money possible. When you say, “Yes! 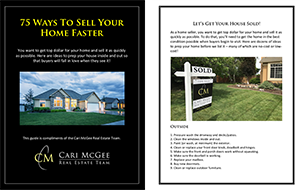 I want the Cari McGee Real Estate Team to sell my house!,” we’ll provide you with all the necessary paperwork for you to complete and sign or initial. The longest form you’ll need to complete is the Seller’s Disclosure Form, which should take about 5-10 minutes. Everything else is just a matter of checking some boxes and signing on the dotted line. Sometimes we’ll suggest painting or new carpeting or for some deferred maintenance items to be addressed. The great news is that we have a list of contractors for all those types of jobs. So even if you’re not handy, we can direct you to someone who is! Then, after our stager visits, you’ll be provided with a list of things for you that preps the stage for the stager to return and complete the job. Sometimes the house only needs a few small tweaks, but sometimes there’s a lot of work involved for both the seller and the stager. And finally, when all of that is finished, our professional photographer will arrive to take pictures that make your house look its absolute best. Then it’s THE BIG DAY!!! We list the house with our local MLS and then the blitzkrieg begins! We descend on social media with posts about the house; we share, we like, we tag, and we market the HECK out of it! National websites pick up the information from our MLS and those professional photos of your amazingly-staged house are disseminated all over the country/world. And let’s not undersell the personal touch. With 15 years of experience, we’re very well-connected in the Tri-Cities. Our team of agents connects with other top agents to make sure they know your home is available and that they should bring their buyers in to see it ASAP. This is done according to your schedule, but you’ll want to be flexible. We want to make it as easy as possible for potential buyers to see the house. When someone wants to see the house, you’ll need to get out and make sure to bring your pets along, too — see if they can stay with a friend, or if you can board them. The more flexible you are, the more people who will see your home. And the more people who see your home, the better the chances are that you’ll get an offer. We’ll ask every agent who sees the house to let us know their thoughts and the clients’ thoughts. However, we don’t always hear back from them. When we do, we’ll help you evaluate the feedback. Some feedback might be okay to ignore, but if multiple buyers have a similar complaint that we can fix, we fix it. Yay! You’ve received an offer. Maybe even more than one! We’ll sit down and evaluate all the components of the offer and what it means to you. You’ll be able to accept, reject, or counteroffer the buyer’s offer and it may go back and forth for a little while before mutual acceptance. Within the first ten days after mutual acceptance, the buyer will have the home inspected. Depending on what is found, they may ask for things to be repaired, they may be willing to proceed with the purchase with no changes, or they may want to get out of the deal entirely. Essentially, at this point, negotiations open up again, and the sale may be in jeopardy. But most of the time, the buyer and seller agree and everything moves forward toward closing. Here’s the next point at which the sale may fall through. If the buyer is using a bank to provide the money to buy the house, the bank will need to determine the value of the property. The bank wants to make sure it’s worth what they’re loaning on it. Most times the appraisal is a match and everything is great. But sometimes the bank’s appraisal comes in lower than the agreed-upon sales price. There are several options we can pursue in that event, and our team members will educate you and help you figure out what is your next best move. Finally, the house is no longer your concern — it belongs to someone else! You are free to move on to the next chapter of your life and the Cari McGee Real Estate Team will be thrilled to have helped you get there! If you’re moving out of town, we’ll be sad to see you go. If you’re staying in the Tri-Cities, we’d love to help you find your new home!